There’s a fair bit to catch up on from the past two months but first we need to get the CAT SPAM out of the way. Yes, it finally happened. As so many of you said it would. We got a cat! And she’s a non-Neighbour Cat, too! Her name is Ziggy and she’s a 2.5 year old tabby with a fluffy ginger belly. We adopted her from a local shelter. After a shitload of contemplation and angst. Now, we don’t have to do this! It’s a big commitment, I know. A cat can live for twenty years or more. So you need to think about this very verrrrrry carefully. I won’t be offended at all! I won’t do it unless you’re fully on board! He kept looking at me like I was off my rocker, saying he was cool either way. It wasn’t until the first night we bought Ziggy home and I was staring at the ceiling at 3am with guts churning like a washing machine, that I realised the commitment issues were MINE ALL MINE. I don’t know what to do with a freaking cat! What if she lives ’til she’s 25? 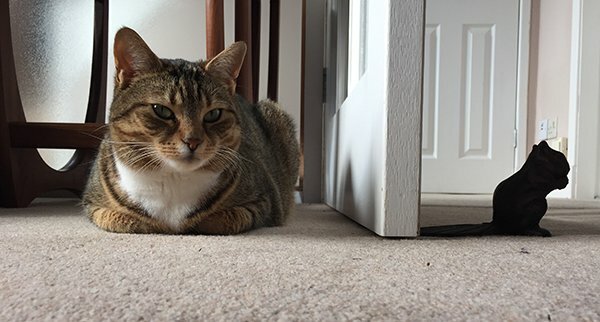 What if I don’t like her as much as Neighbour Cat? What if she’s a jerk? What if she pees all over everything all day long? What if she gets really bored and hates our guts and claws our faces off in our sleep? I can barely commit to a free Boots loyalty card so I dunno how I managed to twist it in my head that it was Gareth holding up the process. But anyway. ZIGGY IS BRILLIANT! 1. She has cute white socks! She looks like she’s off to play a round of golf or referee a snooker match. 2. One paw has a tabby-coloured toe though, for added cuteness. 3. She is tiny wee! I now realise that Neighbour Cat wasn’t just “festively fluffy”, she was a bloody large cat. 4. 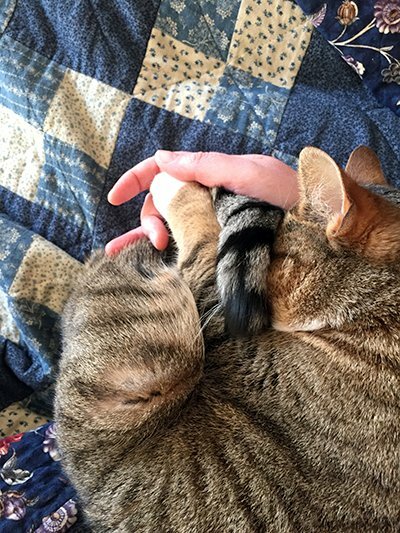 She doesn’t really sit on your lap, but she loves to curl herself around your forearm and use the palm of your hand as a pillow then take a nap. Melt! 6. Sometimes she makes a quiet “brrrrt!”, an almost Space Invaders kind of sound, if she wants to play or have a nap in your palm. 7. 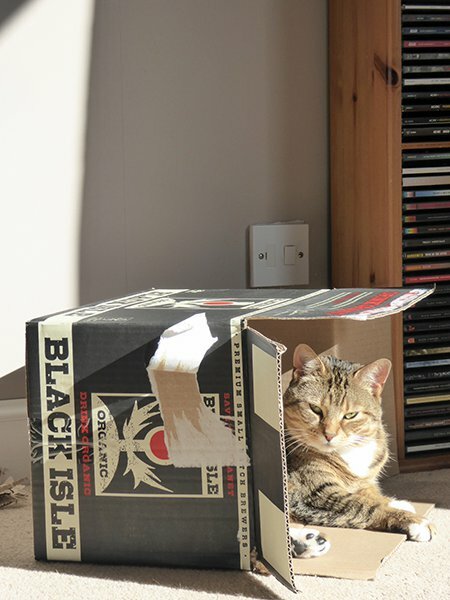 As per cat cliches, I bought her a cat bed and she prefered to sleep in a cardboard box instead. But a couple of weeks ago she finally got in and fell for its cushioned charms. SUCKA! 8. Her favourite game is Chase The Ping Pong ball. You have to say, “Ready Ziggy?… GO!” and throw the ball across the room, and she springs off like a dog, paws scuttling along the tiles. Then she pounces and swats it around. Extra cute with the aforementioned white gloves, like a tiny goalkeeper. 9. 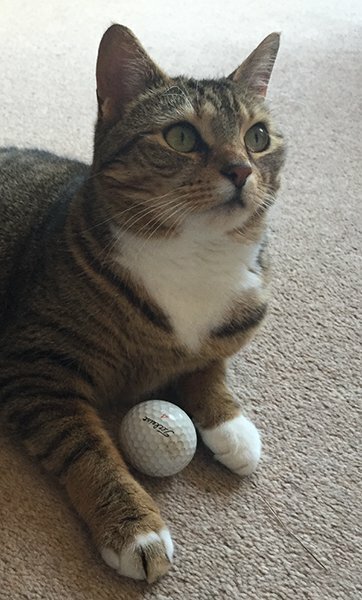 She also has a pet golf ball. Gareth had dropped it in the hallway when we moved in and it rolled under the radiator. We realised this when we heard her battering it off the skirting boards at 3am. 10. She falls for the Cats In Circles thing, every time. 11. Turns out that yes, you were all right. There is room in my heart for more than one cat. I LOVE HER SO MUCH, SHE IS MY LITTLE PAL! Do you like my summer house? If she lives to 25, you will thank your lucky stars for each and every year. She is super adorable! I would agree. We had one until he was almost 19 and I was not ready to let him go. Aw, I’m so happy Ziggy has fit right into your household! As for her lack of vocalizations, adult cats rarely meow at each other. It’s an adaptation they learn when living with humans since humans respond to those sounds. Can’t help it, I’m glad you got a cat. 🙂 Neighbour Cat broke you in nicely! Ziggy is adorable and so lucky you found her. So happy for you, Gareth and especially Ziggy, who seems to realize he’s fallen into a pot of jam. If his friends could see him now!! PS: we sign ‘born to be insiiiiiiiiiiide’ (born to be wild) to Rex when he is prevaricating on the door threshold. We had to have our 16 yr old cat put down last month due to severe ailment. Yesterday we visited the cat shelter to look for a new one. And I found my favorite. The cat whisperer of the household, though, who is my husband :), wanted a night’s sleep over the decision. He has to come up with in today and I hope we can soon welcome a toffee colored tabby tomcat called “Murphy” into our lives. Woohoo! That’s great! Can we see a photo? Murphy is awesome; enjoy him! Ahh I KNEW you’d get a cat! She is absolutely gorgeous! Wow, you’re making me rethink my own cat-adoption ambivalence. Your photos make my heart throb! Was there no downside at all??? 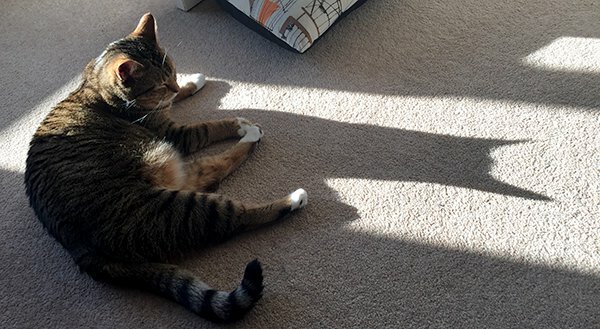 Welcome to the joys of being owned by a cat – she’s adorable and clever, too! You don’t choose adoption pets, they choose you. It’s the universe doing nice things for you. So lovely! But get her insured. We regretted not doing so when Cassie Cat ate a slug pellet (not in our garden) to the tune of £350 vet’s bill when she was a kitten. awwww she is so cute – and I am so pleased you have found a furry friend who will not return to the neighbour when she wants – funny the way cats get under your skin – before you know it you will be the crazy cat lady – ha ha ha! 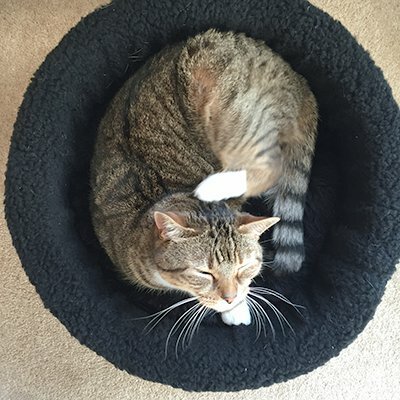 our zinc never took to a cat bed so we got rid of it but she does like to bat stuff around the room at odd moments – does ziggy like a ball of string – even a stray cord hanging from a bench will interest her! Congratulations Shauna! I’m so glad you’ve adopted Ziggy. I loved the posts with neighbor cat in them the best so look forward to lots of Ziggy updates. That little tabby colored toe and those eyes! Forgot to add: love his raccoon tail. He’s a keeper. 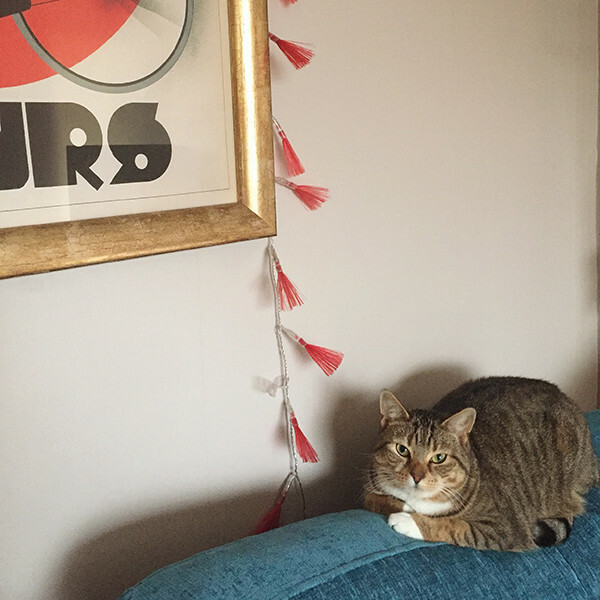 Congrats on adding Ziggy to your family >^..^< !! Just a thot-someone mentioned dangling string for her to play with. Cat toys are better. Years ago my cat had emergency surgery to remove string from his intestines. Yikes! (He made it okay.) After that I put all string away, cut the tails off cat toys, tuck shoelaces inside shoes & no longer use icicles on the Christmas tree. Not meaning to freak you out; just to consider. I love that she has a “pet golfball”! I am so happy you are in kitty cat love!!! They are the best!!!!!!!!!!!! !